Imagine you’re alone in a room. In front of you is a terminal with only two buttons. If you press one of the buttons, you can bring justice to some number of people. If you press the other button, justice will be denied. There’s no one watching, and once you step out of the room there will be no lasting record of which button you pushed or if you pushed neither of them. There’s total deniability, but also total inability to provably claim any credit. Essentially, no one will ever know but you. Which button do you push? A widely held belief among Americans is that in government, the game is rigged. And this belief is correct. Every year, more laws are added. In 1960 there were “only” 22,877 pages of Federal Regulations. By 1975 it was up to 71,224, and in 2013 it was 175,496. And this doesn’t include the rules promulgated by independent Federal Agencies like the SEC or CFTC. These laws are rarely passed for the benefit of the average American; more often they are passed for the benefit of special interests such as licensed occupations, which have expanded from 5% of the workforce to 30% since the 1960s. Every major industry plays this game, even California’s new technology companies originally founded with lofty ideals. Examples of special interests turning the law against the common good are never in short supply in America. The Utah Insurance Commission found that Zenefits prices were so low as to be “unfair” to incumbent companies. Uber is outlawed in Oregon out of “fairness” to existing taxi operators. Tesla is outmaneuvered by car dealers in Michigan, Texas, and New Jersey, preventing direct sales. Policemen who assault and murder regular citizens are protected by their union, prosecutors fail to indict them, and sometimes the offender even gets promoted. And that’s to say nothing of institutional spending priorities like the Senate Launch System, a rocket program many times more expensive than privately available alternatives–but work continues anyway, providing fat contractor awards (which feed back into campaign contributions) in key States and Congressional districts. Of course, I’m not saying anything new. Coverage of the shortcomings in America’s legislative process are well covered by the media and frequently discussed, and thus Congress has well-earned its low approval ratings. Americans know the game is rigged, and they’re pretty unhappy about it. How, even when there’s immense public interest in campaign finance reform, Congress still removes restrictions on donations from the immensely rich in order to keep that money coming. And these are fair points. I am not opposed to campaign finance reform. There are institutional arrangements that would give our elected representatives more time to govern thoughtfully, and reduce the influence of special interests–and we should put them into practice. (My personal pet reform idea is to have the government provide generous matching funds, but only if the original donation came directly from an individual constituent of the office sought, and the money was spent no more than three months before an election – neatly solving both campaign finance and endless election cycles in one law without abridging the freedoms in the First Amendment). But frankly, I think the campaign finance reform movement is missing the larger picture. The fact is, campaign funds are just one way that influence works. Dinners at nice restaurants or fully-paid ski trips to Utah. Stuffing a bag of cash in a Congressman’s freezer. Hiring a Vice President’s son for lucrative and low-responsibility work. The point is, campaign finance (while important) is just one of the ways in which politicians can be bribed or influenced. And the more illegal ones (particularly blackmail and bribes dropped into offshore accounts) are very hard to track or police. Even if Congress inexplicably passed the Platonic ideal form of campaign finance reform, one that both put the general public’s interest ahead of any special interests and avoided all the thorny free speech issues that campaign finance laws usually invoke, you wouldn’t solve these other problems. At the end of the day, as long as politicians have something valuable to sell, a buyer will find a way. Probably the most damning (in my opinion) evidence of this basic truth (that buyers (the guys with money) and sellers (the guys with political assets to sell) find each other) is found in a paper by Martin Gilens and Benjamin Page. If scholarly papers aren’t your thing, here’s a New Yorker article on their findings. And if even that’s too much, here’s a Daily Show interview with the authors. The take-away is that there’s a strong correlation between the interests of economic elites and business interests and the laws that are passed, and basically no correlation at all between the laws passed and the interests of average voters and mass-based voters groups (like AARP or AFL-CIO). What the second group thinks or believes simply doesn’t have a causal relationship with government policy. As you an see, something changed after 1973 or so. When I mentioned this on Twitter, Marc Andreessen forwarded to me this paper which suggests technological change is at fault. But honestly, I don’t believe that. Rapid technological change has been going on for centuries, and the wealth produced by industrialization created widespread prosperity for even the less-well education previously. And even today, companies like Uber are helping taxi drivers (not a high-skill occupation) earn more money. When wealth continues to get created but the distribution changes, something has changed in the relative bargaining power of the constituent groups. And my personal theory is that the reason for that change is the Legislative Reorganization Act of 1970 (the LRA). And this is a really big deal, because if a Congressman can prove what he voted for, he can sell that vote. Vote buying has a long history in the United States, but during the 19th century most of that vote buying and selling was done at the level of individual citizens. Prior to 1896 the US Government didn’t even print official ballots. Local parties would print ballots with their preferred politicians on them and pay workers to submit them to the voting booth. Even George Washington bought votes with bribes of whiskey. Of course, the bribes were enforceable because the ballots weren’t secret–votes were often oral, written down with assistance or supervision, or pre-printed and handed in without change. America didn’t adopt secret ballots in Presidential elections until beginning in 1884, and paying for votes wasn’t made illegal until 1925. Nowadays the thought on non-secret ballots is probably unthinkable to the average America. The idea of employers, neighbors, friends, family, or (worst of all) strangers on the Internet knowing who you voted for almost seems like an invasion of privacy. And widespread knowledge of voting patterns would immediately raise concerns about intimidation. And it my belief that this fine American tradition of vote buying is exactly what’s happening with Congress today (and since the early 70s) because of the Legislative Reorganization Act of 1970. During and since the mid-1970s, the first professional lobbying firms were founded and lobbying spending increased in Washington D.C. from tens of millions to many billions. The idea of earmarked spending was invented in the 1980s and lucratively lobbied for–the lobbyists grew incredibly rich too. Lobbying is now Washington D.C.’s largest source of rich citizens, and as a result the suburbs around Washington D.C. are tied for first (with the suburbs outside New York City that are home to senior Wall St. bankers and lawyers) as the richest towns in America. If the American people want to have a government again that’s actual by, of, and for the people (and not just the top 10% and major corporations), there is only one solution: Congressional votes and legislative drafting must become secret. To many this idea will seem loony. If the votes are secret, how do the voters know whether they are being represented well or not? Well, they won’t, not perfectly, but neither will the lobbyists and corporate donors. And the fact is, voters will never be as well-informed or well-organized as moneyed interests. It simply isn’t impossible to inform or organize hundreds of millions of people. And it’s not even rational for those people to become informed; the average voter simply doesn’t derive enough benefit from understanding the difference between various policy choices to make the effort to learn them worth it. For America to get back to the era before lobbyists controlled the government policies enacted, America must return to a system where votes and drafting cannot by bought and sold. Simply reforming the campaign finance laws won’t prevent bribery or blackmail. Only a legislating and voting system which is completely secret will deny Congressman the proof that they voted for a certain bill or requested a certain earmark be added to a bill, the proof they require to extract funds and perks from lobbyists. You’re still hesitant, aren’t you? Not convinced? I get it. Legislators aren’t like regulator voters. When a voter goes into the voting booth, he’s representing no one but himself. There’s no “wrong” way to vote as long as you vote for the candidates you honestly think are best. And why would you ever vote against your conscience? No one’s offering to pay you to vote for anyone else because they know your ballot is secret. But Legislators – they represent other people. There’s a fundamental principal:agent problem with voters and the legislators they elect, which is how the voters are supposed to trust a legislator to do the right thing behind closed doors. On this point, I ask you to return to the question I posed in the very first paragraph of this post. You’re alone with the room with a voting machine that guarantees anonymous voting. What do you vote for, the wrong thing or the right thing? No one will ever know what you did (and therefore cannot influence the result one way or the other), so only your conscience can be your guide. My contention is fairly simple: politicians are people too. People are often flawed, sinful, lazy, and stupid. But most of them aren’t actually sociopaths. Most people wouldn’t hurt people for the sole reason of enjoying the consequent suffering. Once you remove all external influences most people will do the right thing (as they see it). And for the rare sociopath that slips through, there’s hundreds of other normal, good people who can outvote him. I know in this day and age it seems naive to the point of stupidity to think that politicians are capable of being good. And it’s not my contention they’ll be angels. But rather, consider that most of your adult life (or all of it perhaps) took place in the post-lobbying world where power has corrupted every last one the politicians you knew, no matter how well-meaning they might have been to start with. Take that source of corruption away and maybe Congress can start acting like more normal people again. Highyl flawed reasoning at work here. No one being able to see individual voting records means nothing. The lobbyists and corporations that run the government will still be able to see the results of their money – i.e. what laws are actually being not only passed, but proposed. The proof is in the pudding, not individual voting records. Ah, but that’s where you’re wrong – because there’s no way to know who voted for or against a measure. There’s no way for the lobbyists to know that “their man” is really bought, or if once the doors are closed the Congressmen have a laugh at the money they’ve taken in and then vote however they really feel anyway. A Bill passing or not passing is certainly observable, but if the box of legislative action is a black one, who do you bribe? And how do you know if you’re talking to a grifter? There’s no way to know, or to enforce your preferred behavior, so it’s ineffective. I don’t think the LRA can explain the change in wages or labour income shares. Technology and trade are better suited at explaining macroeconomic changes in wage rates, especially the increasing returns to human capital. 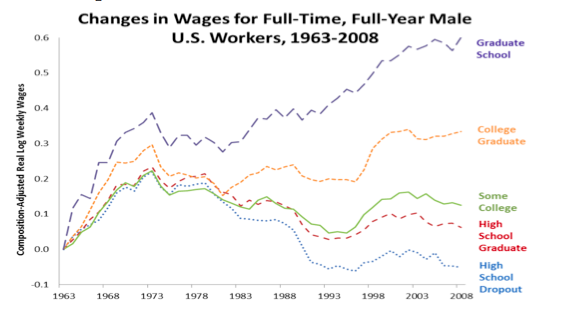 Also wage stagnation isn’t limited to the US. It’s affecting virtually all the frontier economies. That said, as a theory for explaining rates of congressional rent seeking and vote buying more generally, it’s bang on. When the Gruber story was breaking I started to draft a post called “Actually, transparency is the problem.” I’ll probably finish it after exams. Anyway, the gist was to point out the importance of budget secrecy in Canada in terms of keeping our political economy robust from third party influence. In the ’50s, Prime Minister Louis St. Laurent would make the Finance Minister literally type out the entire budget himself, alone, including the wages and salaries of public employees. It has obviously loosened a bit since then. Now they drop hints, poll test, do public consultations, etc.. But at the end of the day the budget is written in secret by the Finance Minister and PM with assistance from the Department of Fin. Even Cabinet Ministers are kept in the dark. The reason relates to exactly what you argued. A Cabinet MInister might demand a project in his home town. Of course that stuff still happens. Much it would happen a lot more if the Finance Minister didn’t hold the trump card of being the only one in the country to know the budget’s final contents. Glad you agree. On that last bit about provincialism, that’s also problem, in my opinion, which is why I favor representation of beliefs to representation of districts. I’d rather vote for more free market regulation would be aggregated with New Yorkers and Californians and Texans who feel the same, rather than having lots of regional interests screw things up with “Spend money in my district!” crap.